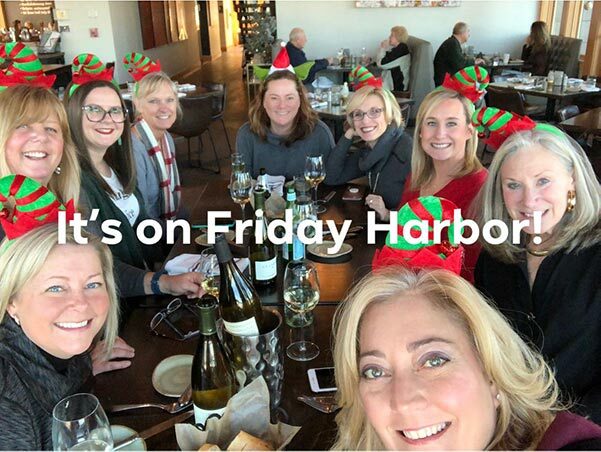 Here’s a note from Leasa Wangoe about this year’s Chardonnay Shopping event, happening on Thursday December 6th, and aimed at getting people into the holiday spirit and supporting local businesses. Downriggers will be offering half off bottled white wines that day for the Chardonnay Shoppers! San Juan Island Brewing is offering 20% off all merchandise for the Chardonnay shoppers! New beanies, socks, and shirts for all your gifting needs Happy Hour 3-5pm with food, beer and wine specials! The Market Chef: Hey, Chardonnay shoppers! The Market Chef will be offering 20% off of all bottles of wine, Chardonnay or otherwise, for your gift-buying OR on-the-spot consuming pleasure!!!! Happy shopping! Tookies Hair Design is offering 25% off all products including makeup. Hours are 9 to 5! Island Wine Company: We would love to see you at Island Wine Company! Take 20% off your purchases on December 6th! We are in the Cannery building next to the ferry and we are open from 10-5. Do a little wine tasting while you shop and check out our great wine/gift selections! San Juan Coffee Roasting Co.: Welcome Chardonnay Shoppers!! San Juan Coffee Roasting Co. is offering you all a 25% off storewide discount. Looking forward to sharing some of our island roasted coffees and treats with you all. San Juan Safaris – 20% off! Hours 8-5 Located under Downriggers. Lots of fun retail and Yeti products!!! Friday Harbor Gallery – 15% off! Hours 10-5:30 Located next to Herbs. If you have never been in this store you are missing out and will be pleasantly surprised with their fantastic selection. Island Studio – 10% off!! Hours 10-6 Serving her special punch which was fantastic last year!! The Earthbox – 20% off gift cards and half off memberships ($50 value for $25) which gives you 15% off massages, facials and product for a year!!! Bluewater: Hey ladies!!! Make sure you stay hydrated! Happy hour prices for all of you all day long at Bluewater!! Cosecha Textiles: Hi all!! Cosecha Textiles will be open from 11-6 and would LOVE to see your beautiful facesl! Many amazing LOCAL handmade goods made right here on San Juan Island from local women! 20% cause why not?! Hope to see you all at our NEW location, 310 Spring Street next to Robin’s Nest! Kings Marine – 20% off upstairs!! Sandpebble offering 20% off store wide including sale items!! Haleys is offering 25% off all bottles of wine from 12-6!! Spring Street Deli: Stop by Spring Street Deli while making your rounds! I will have coffee and snacks. You’ll need something to soak up all of that wine….! Griffin Bay Book Store is offering two for one punches on your book card!! They will be open until 7! Dockside Treasures: Hello Ladies! I’m the new owner of Dockside Treasures at Cannery Landing and would love for you to stop by the shop on Thursday! We’ll be open 1pm to 7pm and the entire shop will be marked down 15%! PLUS get a FREE SWAG BAG (includes b&w Orca coffee mug and SJI or FH decal, while supplies last) when you spend $15 or more! We have a fantastic selection of stocking stuffers! Friday Harbor Trading Post: Come join us at Friday Harbor Trading Post from 1-5 for wine samples, tasty treats, and 20% off the entire store (excluding tobacco products) and 50% off Remote Controlled Toys! High Vibes Head Shop: Hi Ladies! Stop on by High Vibes Head Shop. We are offering a 20% off storewide sale to all of you! We carry a variety of products, CBD oil and lotions, crystals, local art, delicious bath salts and candles! Come say hi, we will be open till 5! Pelindaba is excited to host some local ladies on Thursday! We will be open late until 6pm and will be sampling our organic lavender tea. Chardonnay Shoppers will receive 20% off on December 6th (some product restrictions apply for example this excludes artwork, jewelry and consignment items). At Pelindaba Lavender Gift Giving is Made Easy! We will be offering FREE Standard Shipping on orders within the US, including a complimentary handwritten gift note. In addition to a selection of gift wrap options to choose from, many of our handcrafted products are already gift packaged and ready to give.